"This style is predominantly found in the Midwest, South, New England, and Midatlantic regions, though you may spot subtypes in parts of California. Its popularity in the 1800s stemmed from archeological findings of the time, indicating that the Grecians had spawned Roman culture. American architects also favored the style for political reasons: the War of 1812 cast England in an unfavorable light; and public sentiment favored the Greeks in their war for independence in the 1820s. Identify the style by its entry, full-height, or full-building width porches, entryway columns sized in scale to the porch type, and a front door surrounded by narrow rectangular windows. Roofs are generally gabled or hipped. Roof cornices sport a wide trim. 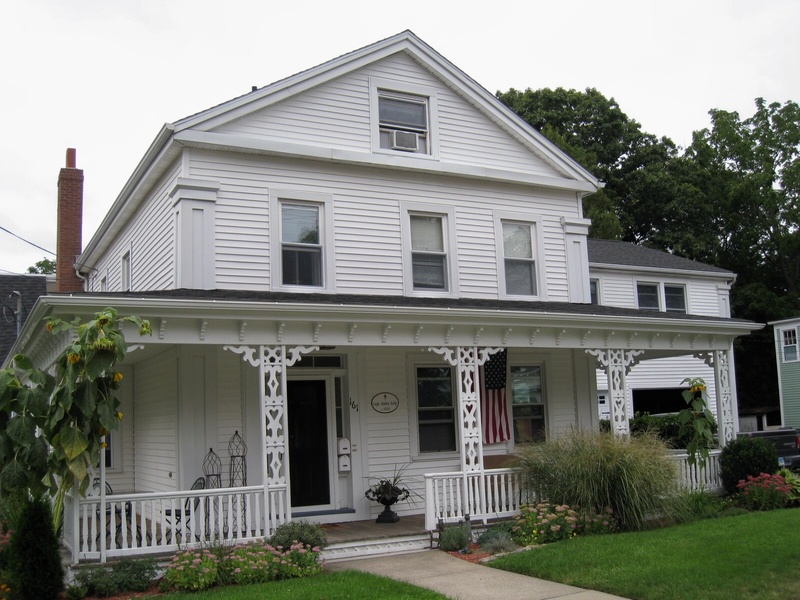 The front-gable found in one subtype became a common feature in Midwestern and Northeastern residential architecture well into the 20th century. The townhouse variation is made up of narrow, urban homes that don't always feature porches." Click here for the resource! Deacon William P. Harris House, 1842—The residence of the carpenter and house builder, and a deacon in the Baptist Church. Samuel Moxley, Jr/Capt William H. Allen House, 1850—In the 1850s Moxley built eleven sizable wooden vessels in his Thames river shipyard across the street from his house. Capt. 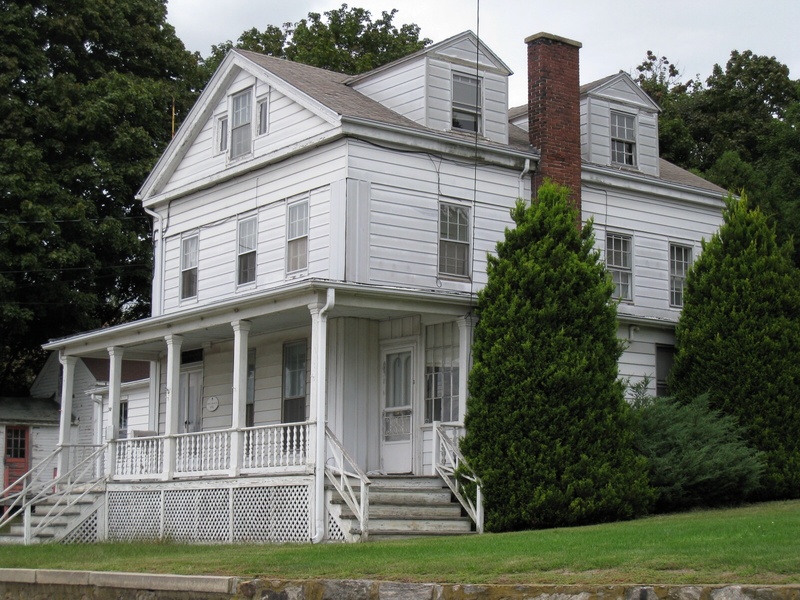 William H. Allen, who bears the fame of having made the most successful voyage on record in the annals of the whaling industry purchased the property in 1858 and made it his homestead until his death in 1907. Capt. Allen was a remarkably successful whaler who sailed from New London harbor and from New Bedford, MA. The cargo from his most successful whaling voyage completed in 1866 sold for $417,000—breaking Capt. Ebenezer Morgan’s record of a year earlier (see below). Later Allen went into business and banking. He was a founder of the Savings Bank of New London and president of the Mariners Savings Bank also in New London. 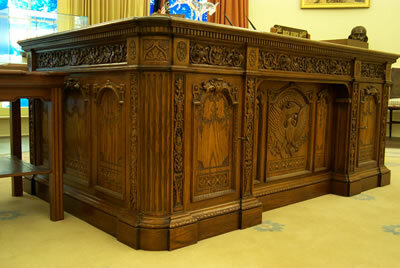 Click here for more information on the Resolute Desk. Capt. Waterman Z. Buddington House, 1844--Capt W. Z. Buddinton was in the coastal and West Indies trade and later the insurance business. His three sons were also sailors and all three were lost at sea; and his daughter married Groton Bank sea captain Sanford Miner. 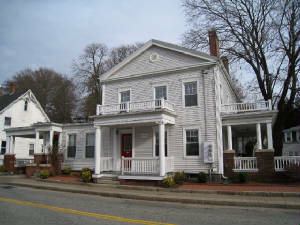 This is the only brick house on Groton Bank. 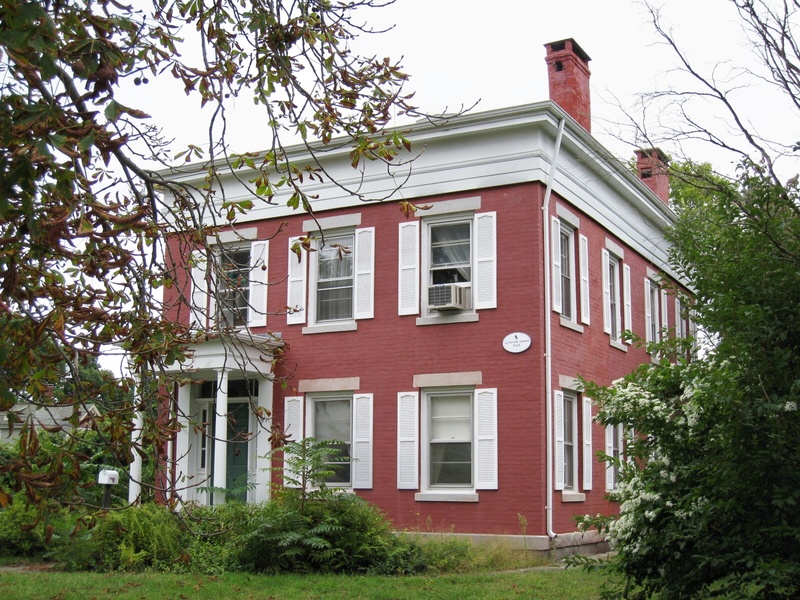 When the captain purchased this property in 1844 it consisted of 9 acres of land which he began to subdivide. A couple of years later he sold 5 acres (on the south side of Broad Street beween what is now Monument and Cottage Streets) to his nephew, whaling Captain James Monroe Buddington, who apparently lived on part of it for some years before buying a house on Monument Street (discribed below in this section). Capt. 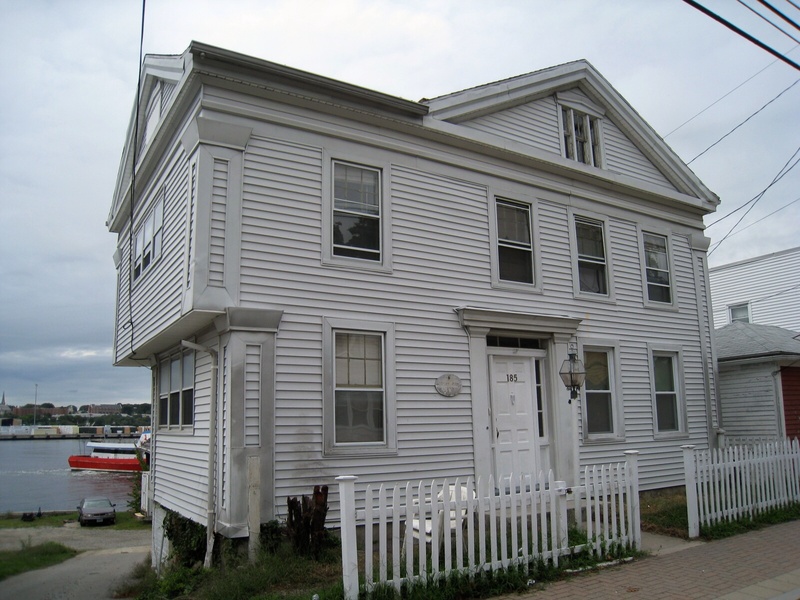 Ruben Kelly House, c. 1850—Kelly was a whaling captain sailing mainly out of New Bedford, MA. 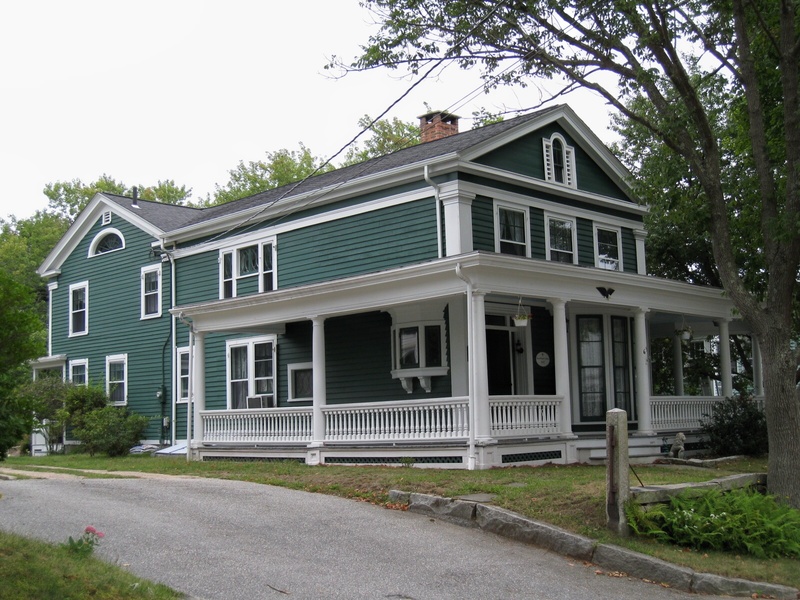 The house was built by Jesse Smith, who in the 1850s built a number of houses on Groton Bank, including the Captain James M. Buddington house next north. 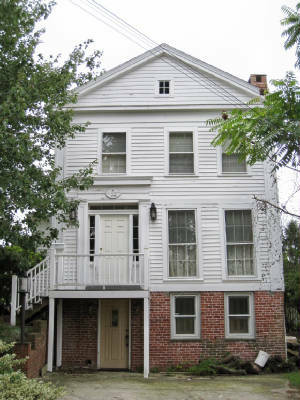 Capt James Monroe Buddington House, 1854--Capt. J. M. Buddinton was an internationally known whaling captain who became most famous for his rescue of the large British ship “Resolute” abandoned in Artic ice after her crew failed to find the lost party of Sir John Franklin who had been searching for the Northwest Passage. With a skeleton crew Buddington sailed the abandoned ship back to New London arriving on Christmas Eve in 1855. The U.S. returned the ship to England and after she was decommissioned, Queen Victoria had several desks made from her teak timbers. The ornate “Resolute” desk, The Presidents desk in the Oval Office of the White House is the most famous (see picture to the left). Smaller desks were given to Lady Franklin and Mrs. Henry Grinnell who supported expeditions in search of Franklin. Grinnell's desk is now in the New Bedford Whaling Museum, MA. Buddington is also reported to have received a desk from Queen Victoria but its fate and what it looked like are unknown. Queen Victoria is also reported to have had two "Resolute" desks, one in Buckingham Palace and the other in her yacht. The latter is reportedly now in a museum in Portmouth, England. 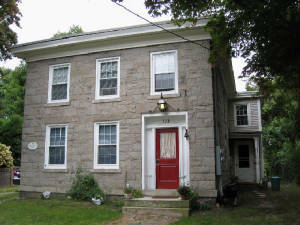 Jonathan Leeds owned the oldest part, the rear, of this house in 1793. In front of that the Greek Revival portion of the house was added in the mid-1800s and a Victorian addition to the left in the late 1800s. If you have any questions or comments, please sign our guestbook!